Sam Moore was free. Free from the tether of the alarm clock, pushy pharmaceutical reps, runny noses, and waiting rooms packed with patients. On the first day of retirement, at the age of sixty-two, he was ready for a change. He stood behind the barn and looked toward the garden. It lured him with a peculiar intensity he'd never been able to explain to Rachel. The pull was visceral, infused with a strong lust for the land. Cirrus clouds skated across the sky, racing eastward and the cool May breeze ruffled his hair, caressing him. He should be happy. But a familiar sense of melancholy washed through him. It was always there, ever present. It retreated occasionally, when he was busy caring for patients. But as soon as he stopped--to take a breath, to look out the window, or to eat his lunch--that undercurrent of sadness, born of loss, returned. It had been this way for fifty years. Fifty years of longing for the truth, of missing his little brother. Sam shot a glance toward the house, embarrassed to have such thoughts. He was glad Rachel couldn't hear the foolish ideas that ran through his mind. Sam's heart blackened. He hated this part. If Billy were kidnapped, he would've tried to come home once he gained access to a car. He had been old enough when he disappeared to remember what town he grew up in. So…if he hadn't returned, he must be gone. Gone for good. Sam sighed and ran a hand through his thick gray hair. Two starlings lit on the birdfeeder and pecked at the seeds. The wooden feeder had suet holders on each end, and his hands were still greasy from the peanut-flavored cakes he'd refilled earlier. A woodpecker hung upside down on one end, tapping at the treat. He realized it would be harder now to ignore the persistent questions about Billy's fate. He'd have time on his hands. Lots of time. Besides tending to Rachel and babysitting his grandsons, he'd have hours to imagine the best and the worst. He slid a hand into his pocket and jingled his keys. I'll just have to keep busy. Squaring his shoulders, he walked into the barn and yanked on the starter cord of the rototiller. It coughed, belched black smoke, and stalled. He nudged the choke back and tried again. The engine roared to life. Sliding the choke all the way down, he shifted the tiller into reverse and backed out of the barn. Sam guided the tiller over the wet grass toward the garden. Its knobby tires dug into the ground, drawing him past the bearded iris bed. His mind drifted to patients and the young doctor who'd taken over his practice. I wonder how Garcia's doing? He'd dreamed about retirement for the past forty years. And here he was, on his first day of freedom, about to embark on a full day of gardening until he dropped into the lovely sleep born of physical exhaustion--and his first thought was about Garcia. Doctor Andrea Garcia had worked by his side since she graduated from the University of Rochester Medical School. She was good. Very good. And she'd take excellent care of his patients. But would she remember to retest Jenny Boyd for strep? An annoying voice hissed inside his head. Forget about it. It's not your job. Not anymore.. It was hard to sever himself from a practice that flourished for forty years. Forty years of growing this "limb" that became such a part of him, and everyone expected him to simply chop it off. Just like that! It wasn't going to be easy. He stopped and looked at the cloudless sky. The strong sun shone through pure azure, although it was just eight in the morning. Leaves rustled in the whispery willows and sugar maples that dotted the grounds. He smiled, drank in the scent of honeysuckle, and propelled the tiller forward. The jungle grew to his left. He'd hacked away at the bamboo-like shoots for weeks after tending to patients all day in his family practice in Conaroga, New York. The official name of the weed was Japanese knotweed, a rapid-spreading invader that killed everything in its wake. Last year's stalks were dry and crisp. They towered twelve feet high, crackling in the breeze. He imagined them taunting him, calling to him. You can't stop us. We're taking over. Sam had worked hard to clear half the knotweed spreading behind the barn near the woods, but a lot remained standing. His bonfires had been impressive. Fueled with dried knotweed, dead apple tree limbs, and bundles of crispy weeds, they roared into infernos, inciting stares from passersby. The coals were usually warm the next morning, when Sam added more branches to the pile each day. He reached the vegetable garden near the above ground pool and set the tiller in motion between the wide rows of sugar snap peas and asparagus. Rachel and he had feasted on purple-tipped asparagus for the past few weeks. His stomach growled. He'd skipped breakfast and bolted outdoors before the sun had crested over the hill. The idea of a brunch of asparagus on buttered toast nearly drove him inside, but he resisted and kept working. Sam muscled the machine around the row of peas and started on the other side. The soil churned like butter. Baby beets grew thick within the row. He smiled again, pleased with the result. He'd defied upstate New York conventions and had boldly planted the beets at the same time as the peas. He'd marked it in his garden journal: March 27th, a rare, eighty-degree day, perfect for the first till. Lila trotted toward him from the woods, hopping over felled logs and skirting piles of knotweed stalks. Her sleek, white body moved with feline fluidity. She meowed twice, raising her tail in greeting. Sam switched off the tiller and leaned down to pat her. She pushed her head against his hand and turned in small circles beside him. "What's the matter, Lila? You hungry? You missed your supper last night. What have you been up to?" She purred and placed her delicate paws on his knees as he crouched beside her. He stroked the smooth fur on her neck and scrubbed his fingers behind her ears. "That's a good girl. Good kitty." When Lila was satisfied, she abruptly trotted toward the house, probably to claim her missed meals. Sam restarted the tiller, finished working the soil between the corn and potatoes, and headed to the knotweed patch. He was ready to dig today. Although the job of clearing wasn't yet complete, he ached to set tine to soil and stir it up. It would allow him to smooth out the area, rake it, and eventually mow the knotweed to death. He maneuvered the tiller over the lawn to the knotweed jungle and slowly worked the soil. The weed colony was founded when he and Rachel owned horses, years ago. When her multiple sclerosis worsened and she needed the wheelchair, the animals were sold, and the knotweed multiplied, infesting the edge of the woods. By the time Sam retired, it had grown expansively, creating "the jungle." Sam was obsessed with ridding the landscape of the infectious weeds. Listed first on his retirement list, he planned to turn the area into a lush lawn, opening it to a line of heirloom apple trees that edged the woods. Something sparkled from the earth. Sam poked at the soil and uncovered a clear glass bottle. He brushed off the dirt. "Bayer Aspirin" ran down the side of the tiny vessel in raised letters. He pocketed it. Rachel would want to clean it and add it to her collection. Such treasures frequently popped out of the earth around the house and barn. Long ago, it was common practice to bury trash, before the emergence of the town dump. Since the house was built in 1815, Sam anticipated an abundance of finds. He continued tilling until he connected with the woody root of a knotweed plant. The tiller bounced up and down, trying to unearth the root. Eventually, after coming at it from several directions, it popped out of the ground. The offender was ten inches long, knobby, and misshapen. It resembled a piece of wood. Pink shoots of baby knotweed sprouted from the chunk. He threw it into the wheelbarrow. After letting it dry in the sun for a few days, he'd burn it. Another object flashed from the dirt. Sam backed up the tiller and dug until his fingers closed around a small marble. He picked it up, rubbed it on his jeans, and held it to the light. The sphere was small and partially opaque. A cat's eye. He turned it in his fingers. Light sparkled through glass the color of lichen; muted, pale green overlaid swirls of deeper green within. He smiled, put it in his pocket, and continued until hunger drove him in for lunch with Rachel. Sam wiped the napkin across his lips and pushed back from the kitchen table. "Thanks, but I'm stuffed. How ‘bout you? There's a little asparagus left. I could make you another piece of toast." He walked past her wheelchair with his dirty dishes. Rachel smiled and patted his hand when he passed. "No, I'm fine." She paused, watching him. "Stop that, now." He reached the sink and looked over his shoulder. "I'll do the dishes. I'm not helpless, you know. " He kept working and smiled. "I know, but now that I'm retired, I want to pitch in more." "Much as I love you, Sammy, I have to admit I've been dreading this day." "What? Dreading it? Dreading my retirement?" She covered a smile. "Don't sound so hurt, honey. It's just that I don't want you to mess up my system. You know, I've got everything organized and if you start helping out, I'll have nothing to keep me busy all day." "Really? I thought you could use the help." "Since my legs got bad, I've needed things to keep me busy. To keep my mind off this rotten illness. The way you fixed the house is perfect. I can reach almost everything, now. I keep to my schedule every day. It makes me feel useful, Sam. I need that." He digested her words as memories of their past flashed unbidden across his mind. The diagnosis came when their children were born, over thirty years ago. Sam took Rachel to the best neurologists in the country, but as the symptoms worsened he knew before they did. Multiple sclerosis. It progressed slowly over the decades, relapsing and remitting as it ran its curious and elusive course. The exacerbations were periods of unusual exhaustion, facial and limb numbness, and weakness in the legs accompanied by frequent bouts of depression and anxiety. Six months ago, Rachel's legs gave out. She'd tried a cane for a while, but fell three times. Finally, and with much angst, she accepted the small scooter Sam purchased for her. She swapped between a lightweight wheel chair and the electric scooter, depending on the circumstance. Sam looked into her eyes. They were still beautiful, after all these years. He leaned over and ran his rough fingertips along the soft down of her cheek. "Okay, honey. Don't worry. I've got plenty to keep me busy outside, anyway." She brushed at her eyes and squeezed his hand, flashing a familiar look of affection. "Thank you." Her voice shook, husky with emotion. Changing the subject, she put her dishes in her lap and wheeled to the sink. "Are you working on those nasty weeds today?" He nodded. "Uh huh. It's slow going. And I have to mow again." The thought of the cool blue air called to him. He felt the pull of the garden as he fidgeted in his chair. His hands ached to be in the soil again. There was weeding, mowing, planting, mulching, and clearing to be done. "Well, then, you'd better get out there. That lawn won't mow itself. And don't forget, the boys are coming later." He had forgotten about his grandsons' visit, but didn't want to admit it. "I won't." He kissed her forehead and walked back into the sunlight, refastening the Velcro on his back brace. A simple arrangement, the stretchy straps worked like suspenders, and the wide, nylon brace rode low on his back. He repositioned it, took a deep breath, and started toward the knotweed colony. As he headed out, a memory flashed through him--brief, but palpable. Billy and he, aged twelve and eleven, had walked barefoot on the hot pavement after a spring rain. Soft tar warmed their feet. Rain puddles sizzled and misted on the road. The boys laughed, then raced home to dinner. Steak, corn on the cob, baked potatoes, and salad. Billy's favorite. Sam checked the date on his watch. May twenty-fourth. Billy turns sixty-one today. The little boy who slept in the bottom bunk, who breathed hot, sweet breath on his face when they hid in the closet beneath the stairs, who offered his sticky hand during scary movies, and who mysteriously disappeared on his eleventh birthday--would be sixty-one today. He closed his eyes and let the wind blow across his face. The breeze lifted his hair. Sam felt the cool soft touch brush his leathery skin. He pictured his brother communicating with him from Heaven. He'd often imagined it, and was comforted by the thought. He opened his eyes, sighed, and ambled toward the stone fire pit behind the barn. He dropped onto the old iron bench and wondered for the millionth time what had happened to his brother. Sam reached into his pocket and fingered the green marble. It reminded him of the marbles they played with as children. Could it have been Billy's? He closed his eyes again and rolled it in his hand. The smooth glass slid between his fingers, warming his hand, then grew almost too hot to touch. Surprised, Sam plucked it from his pocket and inspected it. Strong sunlight glinted on its surface, but it seemed to glow from within. He cupped his hands around it, puzzled by the intensity of the heat. Instantly, a green flash blinded him, forcing his eyes closed. Shimmering, ghostly images danced before his mind's eye. The sound of children playing reverberated in the air. In seconds, he was transported to another realm, wrapped in a rolling cloud of green effervescent swirls. Healey's Cave Copyright © 2010. Aaron Paul Lazar. All rights reserved by the author. Please do not copy without permission. 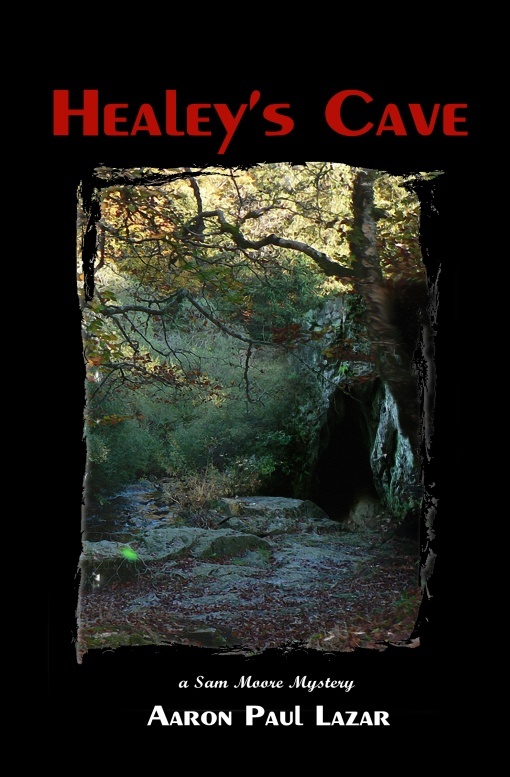 "Opening the pages of Healey's Cave releases a delightfully diabolical mystery with a chilling paranormal plot. Exceptionally written, this book will capture readers with a unique chase for a murderer that transcends time and space. "When Sam Moore retired, he thought his days would be filled with gardening and the joys that come from being a grandparent. He never would have believed he would be tracking a killer through a rift in time. Although fifty years have passed since the disappearance of Billy, Sam's younger brother, the memory of that event still haunts his waking moments. When Sam finds a green marble, the past whispers to him with a powerful and persistent voice. As he holds the marble in his hand, he slips through a supernatural slit in time, causing his memories to come into clearer focus. As he relives the past, its relevancy to the present is revealed with shocking details. "It's always a pleasure to read a book by Aaron Lazar; his love of words is evident with his graceful and gifted writing. Scenes of Sam Moore's garden are depicted with a creative cornucopia of sights and smells, thrilling the senses with vibrant descriptions. His interaction with family members, especially his grandchildren, is portrayed with a generous amount of love and affection. Yet, this author is also capable of weaving a riveting murder mystery among all this beauty...."
Reviewed by Joyce Handzo, for In The Library Reviews. When I began to read Healey's Cave, a new novel by Aaron Paul Lazar, the author and the book immediately captivated me. I was and still am especially intrigued by how the author as artist has drawn his characters. He sketches the relationship of man and wife in soft strokes, like a lovely pen and ink drawing on fine paper. A grandparent taking delight in the love of his grand children, is a pastel portrait framed in gold. Childhood friendships drenched in sepia tones are like old photographs in a long forgotten album taken from the shelf. Flowers in a garden, horses long gone from their stalls in a barn, the feel of leaf mold in the hands of a man who loves the earth--are sense memories so strong, that individuals spontaneously manifest themselves in complete fullness upon the page. ...Sam Moore is a methodical man, used to figuring out mysteries in life by using tried and true principles. He has honed his solid intellect during many years as a physician and isn't prone to imagining things. He begins the very first day of his retirement from private practice with a certain degree of certainty that he would eventually like being away from the office, but before the day is over he is not quite sure whether or not he will be able to keep from going crazy. Sam loves to work in his garden. And now that he has time to spend there, he hopes his love of the soil will soothe and smooth the inevitable feelings of transition he expects to experience. Instead, he begins an adventure of mind, heart and spirit that will shake him to the core of his being. ...Aaron Lazar is a master storyteller. The sense of intrigue never dims in this book. As we look over Sam Moore's shoulder into the fire of the Green Marble, we are drawn with him into an experience of the paranormal, seeing into the unseen worlds he unearths, never to rest until we know the whole truth about what happened to his brother Billy--and to the others. Though never fond of detective stories or murder mysteries myself, even when written by such greats as PD James, or Agatha Christie, I now must confess that I feel quite compelled to read all of Aaron's novels. I love a good story. This is one of the most intriguing stories I have read in a very long time. This page last updated 08-15-10.